Leaf garlands are such an easy Fall craft, if you are lucky enough to live somewhere that the leaves actually change color. The kids can go outside and collect them with you and together you can create an easy and beautiful DIY Fall decoration. If you want to change it up a bit, why not make a heart leaf garland like Jamie. She has a great tutorial that shows you how to use a little decoupage instead of waxing leaves to help preserve them. 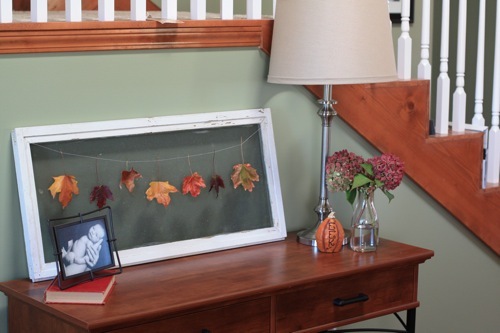 Then you can hang them in your home or even create a framed leaf garland. You can check out the heart leaf garland tutorial over at The Letter 4. and if you want to see some more Fall leaf garland inspiration, check out the sewn leaf garland and the plaster leaf garland. What a beautiful idea. I wish it was fall over here in Australia but it is spring, will have to remember this one. Was just dropping by to let you know I am hosting 'Word for Wednesday' on my new little blog and this week the word is outdoors. You can join in all week , not just on Wednesday or use one of your previous posts about outdoors. Cheers. Okay THAT is gorgeous! Definitely going to have to try that. It'd be really pretty for a photo shoot, too.